I will not be needing this book, so I am giving it away to one lucky reader. Please be advised that Joyce has penciled notes in various spots throughout the book. It has been read, but since I will not need it, I am offering it to one of my United States readers. Please go here to learn how to enter this giveaway if you are not familiar with the rafflecopter. 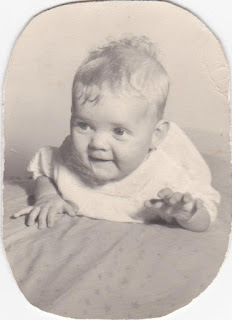 Our Guest poster, Reverend Joyce Rogers, as an infant. Lets hope we can have half of the energy she has had so far in her life. Disclosure: I was given a copy of this book to review in exchange for my honest opinion. This is the honest opinion of my guest poster and is in no way influenced by receiving a free copy of the book. Sounds interesting! And I love books that have notes and highlighted sections. They usually provide a wonderfully different perspective! Wow, sounds like an interesting book for sure. I am always looking for Christian references that are of this nature. Our children are living in an uncertain future and it's up to us to lead and guide them in the things of God and breaking those curses! Awesome. I figured out how to enter Missy, Thanks for showing me.